One of 2018's best films and one of the most affecting and intense horror films of the decade. The ticket line forms just over there. Before you say "Wait, Jim from 'The Office' made this?! ", recognize that John Krasinski's latest directorial effort (he also co-wrote the script) is clever, brilliant in other moments, masterfully composed, and makes us (un)willing participants in his nifty little nightmare of a film. A reminder that you don't need massive budgets, big name stars, and massive CGI to make us squirm in our chairs, take shallow breaths, consume massive soda and popcorn, and then run out and tell everyone how awesome an experience we just had. 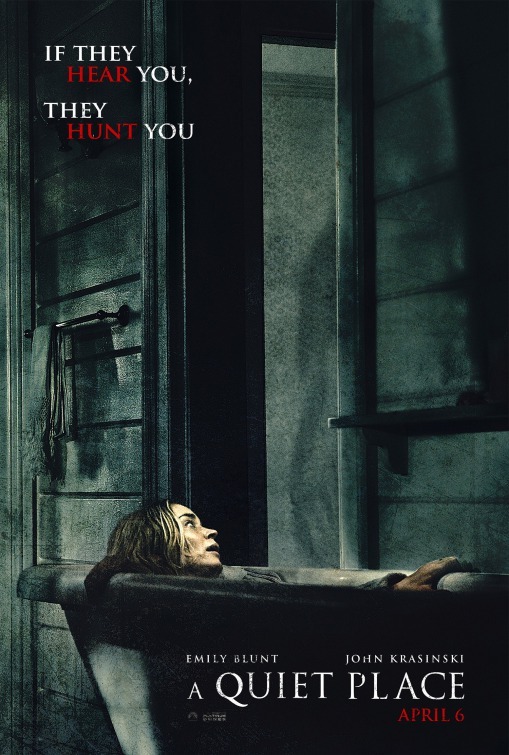 A Quiet Place more than earns a PG-13 rating and features numerous scenes where younger viewers will likely be affected, and perhaps frightened, by what they see and witness on screen. Not for the faint of heart, inasmuch as Krasinski's use of a few jump scares and his absolute commitment to the premise, may prove to be to much for sensitive viewers to handle. You just can't do horror movies. You hate not knowing things ahead of time. You can't do jump scares. Kids in peril. The list could go on and on. And that's okay. The rest of us will be awake for days while you sleep soundly. Is it appropriate to begin a review of John Krasinski's outstanding A Quiet Place by quoting American Idol winner Carrie Underwood's #1 hit single, "Jesus Take The Wheel"? Who cares, I'm doing it anyway: "Jesus, take the wheel/Take this from my hands/'Cause I can't do it on..my...own." Watching this masterful, stunning, breath-stealing 90-minute nightmare that Krasinski has created, I may have found a new religion. Clearly some hieroglyphics were visible on my left hand and fingers, as I clutched a water bottle so tightly, I left indents that stayed for a good hour or two after I willed myself out of the theater. Slight hyperbole aside, A Quiet Place is legitimately one of the best films of 2018, and easily one of the best horror films to come along in recent memory. Krasinski's film is a labor of love for him, as he not only directs the film and stars alongside real-life wife Emily Blunt, he also collaborated with indie horror writers Bryan Woods and Scott Beck on the script. By use of title card, we begin on "Day 89" and see a New York community vacant, still, and uncomfortably silent. A family of five are quietly working their way through an abandoned variety store and Krasinski immediately begins laying the groundwork for the rules at play with his story. No one talks or makes a notable sound. The family uses sign language to communicate. And even though their youngest son Beau (Cade Woodward) finds a toy he wants, his parents, Evelyn and Lee (Blunt, Krasinski), remove the batteries and leave it behind. When "Day 89" brings about a shocking and tragic turn of events, we learn just what is keeping this family so quiet. An invasion has seemingly occurred and the slightest noise triggers rapid, sudden attacks from something otherworldly - a long-legged, monstrous creature with a bloodlust for silence at all costs. They are here, and so far, they are winning the "battle" rather easily. Lee and Evelyn have a deaf teenage daughter, Regan (Millicent Simmonds), who has them committed to living a silent life. Marcus (Noah Jupe) is the middle child, who shares a close-knit bond with Regan, especially in light of what the family has previously experienced. Primarily, the film takes place over the course of Days 482 and 483, where more and more is revealed as to the nature of the family dynamic and the surprising pregnancy of Evelyn. Day 482 also places us three weeks away from her due date, and it does not take a rocket scientist to figure out where A Quiet Place may be going with that particular storyline. What sets the film apart, from so many other films who have played with silence and jump scares, is how brilliantly Krasinski and his team commits to the concept. Within five minutes, Krasinski has us all literally afraid of sound. Think about that for a minute: We are literally afraid for someone to make noise, any noise, in any capacity. Whispers sound loud to us, a creaking step feels like it could trigger an attack, and even as we learn more about the danger that lurks in and around the family's farm, we still are wrecked with fear, as our heart beats so loudly, we worry that we might put the family in harm's way. Find me a film that weaponizes sound like this one does. Krasinski, to his own admission, is not a super huge fan of horror movies, and so his take on the genre emanates from a more realistic and grounded place. In sprinkling in a few words of dialogue to augment the original screenplay, he allows us to bond and relate to this family more than if the film existed in perpetual silence. When Blunt whispers to her son, we understand the inherent need for a mother to communicate with her child. When we see the accidental benefits, in this world, of Regan being deaf, we recognize that her ability to communicate has never held stronger necessity. 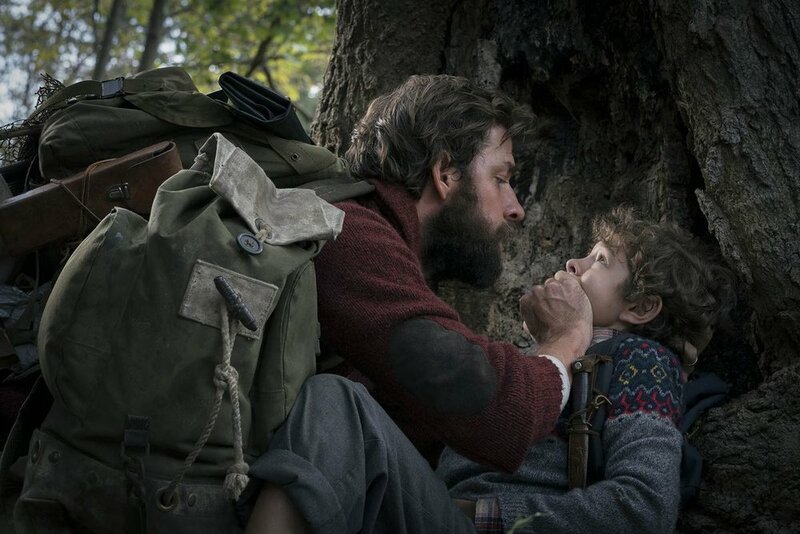 At its core, A Quiet Place could be a movie about a family under siege for making a sound or two, but what emerges here is a powerful story about protecting those closest to you, and valuing the gifts that everyone can offer. There is also an eternal struggle with guilt and inadequacy, the suffocating sense we feel sometimes that we can always do more for someone. Krasinski, as director, and Blunt and Krasinski together, capture this over and over again. At the end of the day, I would be remiss to not acknowledge that the film's delivers a couple of plot points which feel crafted simply to further the movie along; namely, how could you even remotely believe you should get pregnant and raise a newborn baby in this type of an environment? Lee and Evelyn seem way too smart and thoughtful to have this happen to them. But to Krasinski's credit, those questions dissipate when we hear that baby cry for the first time and we know what that might mean. Or, if we balk at his use of Marco Beltrami's score in the film, we stop caring when we realize that Regan is unaware of something emerging behind her., or in the moment Evelyn fails to realize that she may not be alone in a room she thought she was safely protected in. A Quiet Place is a stunner. No one made a peep when I saw it in a theater, and I cannot wait to see how people respond to a movie we all will be discussing for a long, long time to come. Starring: Emily Blunt, John Krasinski, Millicent Simmonds, Noah Jupe, Cade Woodward.